This is the first blog post for Lernabit, so I want to take this opportunity to thank you for checking it out and also to introduce myself and the goals of this site. My name is Aaron Wright, and this site is an attempt to address a problem I have had with education. The problem, simply stated, is that education is not accessible. At first glance, many people will dispute this claim. After all, the Internet and smartphones have made information more accessible than ever. But that only applies to accessibility in terms of physical access. As far as time is concerned, accessibility is still a major problem. The Internet already has plenty of educational material, but what the world needs is content in a format that can teach you wherever you are as time permits. That is precisely what Lernabit is all about. By delivering educational content in small chunks in audio format, you can learn and discover new topics in the small moments of downtime throughout your day. There are a lot of long format video lectures online, but not everyone can sit down and watch a 45 minute lecture. However, most people can listen to short 5-10 minute lectures on their way to work, or even at work. Eventually it will all add up to the same amount of content, but by chopping it up into small chunks, it can work with your schedule. This format allows any small moment throughout the day to become a chance to learn new things. You won't have to choose between education and working, because it will work around that schedule. You won't have to sacrifice fitness for educational content, because you can listen to it at the gym. You can listen on your commute, or while shopping, or while doing things like cooking, cleaning, or other boring tasks. That is already a solid 4 hours of downtime every day, and that doesn't include time at the gym or even time away from Netflix. If you include that time as well, your free time available for educational material would be comparable with the amount of time a full-time college student spends between lectures and studying. 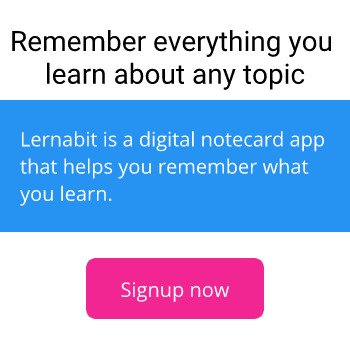 My goal with Lernabit is to turn that time into moments of mental stimulation and education. Create your free account now and start learning!